We had to wait until slack tide to get out of the slip safely. When it arrived we said our good byes to a few of the live-aboards nearby who Dave knew. Of course we also got a few more words of advice (everyone always has some input on which route to take sourthward). We then cast off the dock lines and shoved away from the dock. I think Dave had been dreaming of this very moment, and here it was. We stopped at the fuel dock to top the tanks and waited for about an hour for the tide to go down another foot or so, to safely get us under the bridge. It was 1pm. We were off. We followed the channel markers out of the Charleston harbor area, past Fort Sumptner and outward past all the buoys (nearly 14 miles of channel) then adjusted our (port)tack for an easterly course. The seas were pretty rough and the wind was blowing steadily at 15-18 knots. After a couple of hours of the rocking motion we all began to feel a bit queasy. Needless to say, towards the evening none of us had much interest in eating. As the night went on, the wind started to blow harder - up to 25 knots. 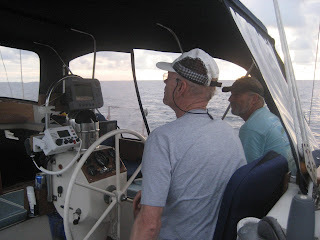 We decided to take the main to the second reef point but had a problem with the outhaul. We decided just to take the main down and only fly the reefed jib. We were more comfortable and were still able to make 6.5 knots. The wind blew strongly all through the night. We had a good run and made good time. For the rest of the day, the sea remained confused and choppy, making for an uncomfortable ride. But as the day went on we adjusted and got more at ease. We fixed the problem with the main's second reef point and turned on the generator. The Monitor windvane kept us well on course and the boat felt like she could easily handle the weather and seas. One very useful piece of equipment that Dave had installed was the dodger and full skirt around the cockpit. It kept the warmth in and the seas out of the cockpit.. The second day out was rough. The fact that we hadn't fully gotten our sealegs together with stormier weather was a double wammie. But we made good progress with the strong easterly wind and steep seas. In the evening the wind turned to a southern direction (right where we wanted to go) and increased its intensity. We were a bit unsettled but headed the boat west, towards the Florida coast. What we didn't want to do was go so far towards land that we met up with the Gulf Stream that runs directly north. Near midnight, the seas got even bigger, the wind piped up and then it began to rain. No, it was pouring! We were surrounded by thunder and lightning shows - something that makes mariners unsettled because in the ocean, lightning looks to strike at things higher up. In this case, the mast of the boat is the highest thing around. 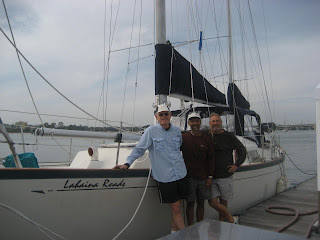 Rather than sailing too far west to Florida, we turned the engine on motored directly into the oncoming swells and wind. It was a rough ride and a lot on the boat got wet (inside and out). None of us got much sleep during the night. We all just cat napped. After a few hours of motoring, a warning system that Dave had installed, notified us that the fuel filter was getting dirty. Luckily, he had installed a back up filter system so he just had to flip a switch to use the other filter. Very handy but likewise we knew that all the pounding that the boat was doing was stirring up the particulates on the bottom of the fuel tank. It would be only a matter of time before the warning system would signal a problem with the second filter. And that it did. But luckily, soon afterwards, the wind died down and started to come around from the SW. We now were able to make more mileage southward, all-be-it slowly. With the wind shift, the weather improved leaving only an occasional lightning strike nearby accompanied with the sound of thunder. After all we'd been through, one would think that the third day would bring us some nice and steady winds from the NE, allowing us to sail smoothly to the Bahamas. But the weather wouldn't hear of it. Indeed we were able to sail for a short while towards our destination. But in the end, the seas flattened and the wind died down. After Dave replaced the fuel filters we started motoring again, which we continued to for the rest of the day. We were able to dry a few things out, get some rest and have food. We were starting to get our sealegs. Under starry skies, we motored for the rest of the night, We took our one hour shifts, allowing each of us to catch up on lost sleep in two hour increments. The one hour shifts seemed to work well for us. The night was uneventful and by morning we found ourselves just 180 miles from Eleuthera. For breakfast we had coffee, English muffins and bananas. Afterwards, Dave set out to do some chores on the boat (including, again, changing the oil filters, calking some leaky areas on the deck and fixing an indicator light).I think he enjoys staying busy. Marty provided assistance, while I started perusing the books and charts of the Bahamas, specifically on the islands of Abaco and Eleuthera. One of the things one needs to keep in mind when arriving at an island by yacht is arrival time. We don't go into a harbor at night. So if we arrive too late in the afternoon or early evening, we might as well have slowed up on our last day out to ensure a morning or early afternoon arrival. With that in mind, I looked at the island of Abacos as another possible suitable point of entry that was a little closer to Eleuthera. The strategy will give us a couple of different entry options when we get close. The weather in the afternoon stayed calm. We sailed for a few hours but had to succumb to more motoring when the little wind we had, became a light little puff. We had a light lunch of crackers, smoked sardines and herring, and relaxed. A little later we put out a trolling line, in hopes of catching something for dinner. By now, we've gotten into the cruising mindset. I've lost track of what day it is. To catch up on my log - we were unsuccessful in catching anything for dinner or breakfast for that matter. The night was calm. We mostly ghosted along sailing at 4-5 knots, with a very comfortable mid-70's temperature. But by early morning, the weather picked up and it of course was right on the nose again. Marty had been philanthropic in nature and had taken two hour shifts to our one hour shifts in the night. I guess for some reason, he felt too well rested. We started to see the lights of Great Abaco (norhtern Bahama island) in the early morning. It was a lee shore, so we wanted to give it a lot of room by staying far off. Our intent was to skirt around Abaco and continue to Eleuthera. But as we continued and morning came along we realized that Eleuthera was too far to make it by night fall. So we made a quick decision to fall off and pull into Marsh Harbor, Abaco. We sailed towards the channel entrance called "Man O War". As we approached the entrance, we could see breaking waves on either side. No markers. All we had to go on was GPS coordinates and then a magnetic bearing. We set the course to the entrance and followed it in, with me steering and Dave as a lookout for any coral heads that might be ahead. But all went smoothly. We entered the channel and proceeded to Marsh Harbor about 2-3 miles further. After setting anchor, we hoisted the yellow quarantine flag and had a beer (not necessarily in that order). We then got the inflatable dinghy out and proceeded to find Customs and Immigration to pay the obligatory $300 entry fee, which covers the boat and a fishing license for an entire year. Too bad we'll only be here for a few weeks. I must comment to say that the local bureaucrats at both offices were very friendly and accommodating. Afterwards, we walked to the downtown area of Marsh Harbor. 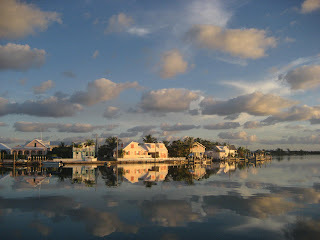 Although it is the "big city" of the Abacos with a secure harbor, the downtown area is comprised of ramshakle non-descript group of strip malls. A bit of a disappointment. But there were some nice waterfront restaurants and bars. We went to one called "Snappas" and had some drinks and dinner. Marty treated. That night we turned in early. But soon afterwards, the wind started picking up. Then the rain came. When we were in our warm bunks, Dave happened to look outside to notice that we had moved position. He went out on deck to find our anchor was dragging and that we were rapidly approaching boats docked at the Harbour View Marina. We quickly started the engine, maneuvered the boat away from the marina, while picking up anchor. The wind was strong and the rain was heavy. With no moon to assist us, it was difficult to see exactly where we were. But we managed to get situated away from other boats and reset the anchor, this time putting out lots rogue. The Chinese fire drill was over. We were soaking wet, tired and ready for bed. We awoke on Thanksgiving Day to much fairer weather. After breakfast, we mostly worked on the boat. My big task was to unclog the forward head, a truly crappy job - but I had happened to be the last to use it when it failed! After taking everything apart, I found that the problem was a thruhull fitting that had gotten really clogged with shell-like matter, making a 1 1/2 inch pipe have an inside diameter of about 1/4 of an inch. No wonder nothing was getting through! I cleaned it up and things worked a lot better. Other tasks worked on were drying cushions, changing oil filters (again), and general boat clean up. Later on we took the dinghy to the Harbour View Marina to see if we could get a shower. As we opened the door, we were greeted by a lady behind the counter. She took one look at us and smilingly said "I know what your here for - it's $3 per person for a shower!". We all laughed. She said " And you can't just get one shower and split it with the three of you!" I said, "Don't worry, we're friends, but not that good of friends." Hilarious. We pulled up anchor at 9:30am and headed towards the Shell fuel dock to fill up the tanks with diesel and water. We were underway soon out of Marsh Harbour. Our plan was to head south in the reef (the protected area from the swells outside). Basically it was an exercise in navigation, with setting waypoints on the GPS and following them to the tee. If you vary much outside of the course, there are shoals. Not much room for error. Overall, things went smoothly and we got to the area where we wanted to position ourselves for the run to Eleuthera next day. We anchored in about 15 feet from a white, sandy beach off of Lynyard Cay - we could see the breakers breaking on the other side of the reef. But where we were it was calm. A comment about using GPS waypoints - this type of navigation is so different from when Diane and I cruised thirty years ago from 1980-82. Back then we used celestial navigation with a sextant to get to an island. Once there, we had to pilot ourselves through the inner reefs using available charts and local navigational markers. Sometimes I'd climb up the steps on the mast to check for coral reefs. Today, we plug in positions into the GPS and head towards them. There are even photos on the GPS that show the channels and harbors from a bird's eye view. It's all quite different. Dave is more at ease with the system since it closely resembles what he uses on the plane. Getting back to the cruising story - after setting the anchor, we got the dinghy in the water and went to the white, sandy beach. Good beach combing area, although sad to say, it was littered with plastic trash. After a while I went snorkeling, searching for conch shells for dinner. But all I found were dead ones that already had been eaten. You can tell if they've been eaten by the slit they have near the top. That's how you remove the muscle inside the shell. While on my escapade, I gave Marty and Dave had a scare because they had continued beach combing and afterwards didn't see that I had ended up back at the boat. When they couldn't spot me, they went looking for me. My bad. I should not have gone off snorkeling without telling one of them my plan. Sunset was beautiful. With a beer, we opened a couple of cans of smoked sardines and herring with Jacob's crackers. Delicious! A perfect way to start the evening. We got up before sunrise to get ready for the passage to Eleuthera. It was about 50 miles and we needed to get there before sundown to safely traverse the pass. We also didn't want to leave to early from our anchorage because we needed to go through an unfamiliar pass to get to open waters. Another way we could have made the passage was to go through through the pass before sunset, sail in the night and make landfall the following morning. But the way we chose to do it, afforded us some play time on Lynyard Cay, snorkeling and a good night's rest. Once outside of the pass, we headed on a southern course towards the tip of Eleuthera, to the small town of Spanish Wells. Spanish Wells lies on St George's Cay which is a stone's throw from Eleuthera. It gets its name from the early explorers who found fresh water there. The community dates back to the 17th century when Eleutheran adventurers left England for religious freedom. After picking up a mooring and securing the boat, we headed to shore. It seemed like an attractive enough town with small cottages and neat gardens. But it was Sunday - nothing was open. As we walked, we continually saw the same people over and over driving golf carts around the few streets. That appeared to be Sunday's entertainment. After walking for an hour or so, we did find one restaurant that had just opened for the evening. We went in to check the menu. The prices were a bit steep and we noticed that no beer was listed under beverages. We asked the young woman behind the counter if they served beer. She answered, with the most dreaded two words to a sailor. "This is a DRY ISLAND." We thanked her and left. In the morning, we left Spanish Wells through the southern pass into the bay. We headed towards the Current Cut, a narrow pass that opens into another bay. In that it's a narrow pass we had to time going through it since it drains in either direction depending on the tide. Waiting for slack time, we anchored off to the east of the cut and went ashore to check out the Current (island) Settlement. There wasn't much there but a sparsely stocked grocery store. We had managed to find the only other island in the chain that was dry. We chuckled (only because we knew we had beer on the boat!). We returned to the boat and went snorkeling. We looked for conch shells but only found a dead one. At least it was in very good shape. By 1pm, the tide was slack so we proceeded through the narrow Current Cut. There was still some current left, but we managed to go through it with only a small bump on a shallow sand bank on the other side. 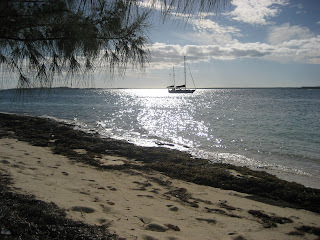 We then set a course for Hatchet Bay (Eleuthera). When approaching Hatchet Bay all you see is high, limestone cliffs. It's hard to spot the narrow gap (cut) until you're almost upon it. We had no problems getting through the pass and into Hatchet Bay. This anchorage is known as the "Home of the Country's Safest Harbor." We could see why. It's a little circular harbor surrounded by a hilly terrain, with Alice Town on the east side. A quaint anchorage. We picked up one of the free, government-owned moorings and took a walk into town. A few bars and a small grocery store and some churches. We had a rum and coke at one of the primitive bars and watched some locals playing dominoes. They were fun to watch. They were a lively group and each would loudly slap down each domino piece with gusto. After our drink we went back to the boat and had dinner. But at around 9pm we heard a lot of loud drumming coming from town. So we decided to investigate. We took the dinghy back in and found a group of about fifteen men parading down the narrow street banging on various drums. Definitely a good beat. We could feel the vibrations of the drums as they passed. Further on, we spotted a half dozen brass musicians practicing Christmas music. They needed more practice. After sailing most of the day in clear blue water within the confines of the Eleuthera reef, we came to the pass that led to deep water. We had started the engine to give us more maneuverability in the narrow pass and taken down some sail. As we got in the middle of the channel the engine sputtered and died. Of all the luck. Fortunately, the wind was from abaft and the channel lhad a few dog legs that could be maneuvered under our sail heading. Dave went below to check on the cause and we discussed a coiuple of emergency options in case things didn't fare well. For example, we coulld put the inflatible dinghy in the water with the outboard, tie it along the boat and use it to get some steerage. We also could anchor quickly. This was going to be an overnight trip since Georgetown was about 80 miles away. But all was going well under sail. A short time later, Dave determined that the engine had sucked in air due to lack of fuel to one of the fuel filters. This meant having to bleed the air out of the fuel line - a task that's not a lot of fun even at the dock. But a short time later, Dave had the engine running again. We were now out of the channel and plugged in our new waypoint to Georgetown on the island of Great Exuma. Night was coming and the wind was freshening up. We decided to reef the main to the second reefing point and also reefed the jib. Good move. Within an hour it was blowing 20 knots with seas building. We had a spinach lasagna for dinner with a small glass of wine and at 9pm started our hourly shifts.During the night, the wind got up to just under 30 knots with confused seas of 4-6 feet. It wouldn't have been a bad ride had it not been that our heading was directly into the wind and seas. So we continued to motor sail. We sailed all night, taking our shifts, and by morning we were about 25 miles from our destination. Having the wind and seas against us had really hindered our progress throughout the night. We got into Georgetown at 2pm after getting through the pass and making our way inside the reef. The wind continued to blow the entire way, even as we maneuvered the boat into the marina slip. After getting settled in the three of us headed into town for dinner. We ended up at a waterfront place called Peace and Plenty. They served a very tasty dinner of conch shell chowder and pan-fried snapper. At $28 per plate, it wasn't cheap! The band started to play as we left. Musically, they weren't too bad. But their lead singer had a monotone voice. Today was Marty's day of departure. He was taking a plane from here to Miami and from there back to SLO. We stopped at the grocery and hardware store for some supplies. I'm updating the blog in this hole-in-the-wall place called J&K's Electronics. It looks like a place in the barrios, with bright greens and yellows, bare wood desk along the wall, with some old computers. But if you bring your own, you can sign on to their wireless. Seems to work well. Later this afternoon, Dave and I will take Lahaina Roads to an anchorage near the outside reefs so we can go snorkeling. We'll be there for a couple of nights. That's all for now. Hi G- Sounds so scary and so exciting! I have only read to the end of Thanksgiving Day. I cannot believe what I have read so far! Especially the part about YOU drinking BOX wine! Hmmmmm - indeed! I will read the rest later. After all some of us have to work! Thanks for sending the blog info. I will try to keep up with your trip! Excellent cruising descriptions, George. I'm having great fun following you on Google Earth -its almost like being there! Keep naming your anchorages. Good job, guys! Really enjoying living vicariously through you as I sit here in my office looking out at a cold and gray day. Have fun, talk to you soon! Congrats sea-dawgs. All is well aboard Loggerhead here in Charleston. Wish I was on board Lahaina Roads with you all though--cold and rainy here. Keep up the blog and pictures. Hope to catch up with you all sometime somewhere soon.